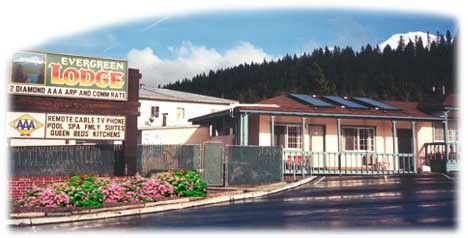 Evergreen Lodge offers the best in lodging for business, traveler's and vacationers. Quality and comfort at very reasonable rates. 27" remote control stereo TV's. Full kitchenettes in selected rooms. Non smoking one or two bed rooms. Large out door solar heated swimming pool and extra large hot spa. Our motel is conveniently located a short distance from I-5 and I-89 exits near most restaurants and down town commercial areas. We are just minutes away from all our great local attractions like skiing, golfing, fishing, hiking, mountain climbing, boating, water rafting, water skiing or canoeing in the lakes of the lower sacramento river. Need driving instructions? Click here to visit mapquest.com. All you have to do is enter your address, and our address and mapquest will give you step by step driving instructions.